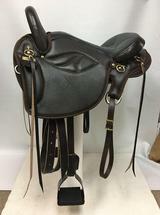 I just can’t thank you and National Bridle Shop enough for helping me to find the saddle I have been looking for. I tried riding English and didn’t really like them. I’m more of a western person. I didn’t want a horn any more and have been looking for a very cushy comfortable saddle that fits me and my horse. You took the time and listened to my wants as well as looking at photos you requested I send you. You were correct about what size saddle I needed as well as the width my horse needed. 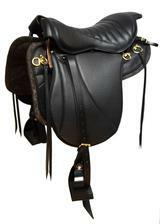 The saddle I purchased from you is the TPS plush lite endurance saddle with fenders that I prefer. I don’t have a gaited horse and you were right again because it fits great and she can move beautifully. I am retired (67 years old) and ride all the time. I’m in the saddle at least 10 hours a week. The saddle is soooo comfortable. I even rode this am in the rain because I can’t get enough of this wonderful saddle. I love posting in the trot and canter in this soft seat. I don’t feel like I’m in a saddle.I feel like I’m on a marshmallow. I’m strictly a trail rider. Your customer service and products are tremendous. I follow the center fire rigging that your video explains so clearly. If any of your customers would like to ask me any questions feel free to give them my number or email address. 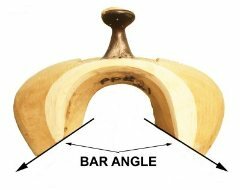 The bar angle is the defining element of the tree as to saddle fit with swell gullet width, twist, rock, flare, crown, relief, length, pattern and channel as secondary elements. This angle is described in the generic terms of: quarter horse bars, full quarter horse bars, semi-quarter horse bars. Tree makers express this angle in degrees and is calculated by a geometric and mathematical formula. The higher number in degrees the flatter the angle. The angle of the tree bar must correspond to the angle of the horses saddle pocket (below the withers and back of the shoulder blade). When this is achieved, the margin for error in fitting is drastically reduced. A positive fit is just a few steps away.